Tarangire National Park is the best-kept secret of the northern circuit - situated 120 km south west of Arusha it is renowned for its diverse bird population, large herds of elephant and majestic baobab trees. The density of game is second only to the Ngorongoro Crater - you can find many of the large African mammals here, including lion, leopard, buffalo, and lesser and greater kudu. The park is named after the Tarangire River that runs through the center from south to northwest and drains into Lake Burungi. Oliver's Camp is situated in the remote south-eastern part of Tarangire National Park, in the middle of Tarangire's unspoilt wilderness zone. The camp is ideally placed to access the yearly migrations of wildlife and the best chance of seeing lion, leopard and cheetah. During the dry season, the swamps are filled with elephant, buffalo and zebra. The camp is the perfect base to explore the busier baobab-country in the north of the park, but at the end of the day, guests return to the absolute exclusivity of Oliver's Camp. Each of Tarangire’s seasons has something unique to offer, making Oliver’s Camp a year round destination. After the rains of April and May comes a beautiful time of the year for walking safaris. The wildflowers surrounding Oliver’s Camp are in season and resident game of elephant, giraffe, lion, leopard and impala are in abundance. As the dry season approaches, the migratory wildebeest and zebra return to Tarangire, lured by its reliable water sources. During August, September and October, incredibly high concentrations of wildlife can be found crowding the dwindling water supplies in close proximity to Oliver’s Camp. During the dry season, Tarangire has the highest concentration of mammals per square kilometer of any Tanzanian national park. When the rains return in November, the large herds disperse in all directions searching for better grazing. When the herds depart, the flowers return and the land regenerates. The short grass and cooler days are perfect for longer walks. The migratory birds have long since returned and for the resident game it is the start of the main breeding season. Oliver’s Camp has one of the most wonderful settings one could imagine and offers an unparalleled bush experience. Managed by Ken and Michelle the camp offers one of the warmest welcomes and a level of expertise (on many things including photography) that makes Oliver’s one of the most sought after camps in the region. The camp features ten beautifully furnished guest tents scattered along the marsh edge with excellent views over the permanent water source. Each newly refurbished tent is now covered by traditional thatch and offering an outdoor shower with indoor toilet and wash facilities. 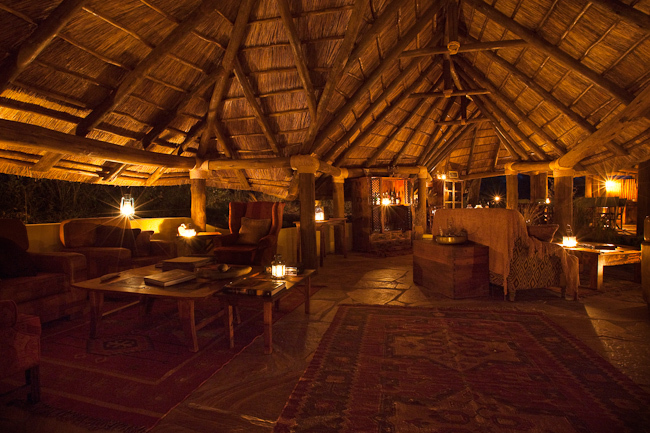 Every evening, guests relax or read in the lounge and library tent, or drink sundowners at the fireplace after an exciting day in the heat of Tarangire. The range of activities on offer at Oliver's Camp is unique for a camp inside a Tanzanian National Park. Off-road driving allows you to get closer to the action. Walking and Fly Camping add another unique element to a safari. The park's stunning natural beauty is ideal for wildlife and nature photography. Walking is the absolute specialty of Oliver's Camp. The privilege of walking in these natural areas gives you an exhilarating feeling of adventure. Although you'll usually get close to large mammals such as elephant, giraffe, buffalo or even lion, walking safaris are very safe. The experienced guides of Oliver's Camp and an armed national park ranger will accompany you on every walk. Walking safaris can take an hour or a whole morning or afternoon, but combined with fly camping, they can take several days, letting you discover the most remote parts of Tarangire. The fly camp is typically booked as part of a walking safari or simply as a completely private night away from the main camp. The stunning beauty and richness of Tarangire's nature and wildlife and the wide range of activities at Oliver's Camp are best enjoyed by staying at least 2 nights. Ideal for those who really want to experience nature in its purest form, Oliver’s Camp offers undisturbed open vehicle game drives, adventurous private fly camping and walking safaris that allow for a rare chance to stalk elephant on foot. When Paul Oliver first came to Tarangire in 1985, he found what he had been looking for in his years of travelling through Africa: a wild and unspoilt national park. Paul guided and travelled for 7 more years and in 1992 he started a small camp in Tarangire, aimed at offering his guests an authentic African experience. Having started just outside the national park, Oliver's Camp moved into the Tarangire National Park in 2001. Although walking safaris were previously not allowed, the national park authorities have since allowed camp guests to walk inside the park. In 2004, Paul handed over the camp to Asilia Lodges & Camps. The atmosphere of intimacy and a true bush experience prevail in this wonderful small camp in the wilderness of Tarangire.